Stoneware, china, and glass mugs with infusers and lids. 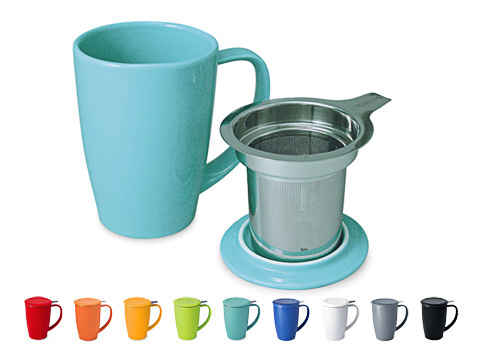 This CURVE Tall Tea Mug and lid, complete with an extra-fine 0.3 mm hole stainless-steel infuser, is designed for a simple and clean way of steeping just one fresh cup of tea in your own cup. 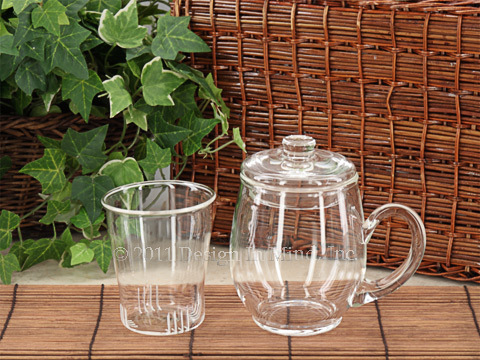 The extra-fine tea infuser enables you to steep fine loose-leaf teas to large whole-leaf teas. Lid doubles as an infuser holder when tea is done steeping. Dishwasher-safe. Microwave-safe, except infuser. Lead-free glazed porcelain with stainless-steel infuser. 5.25" H with lid and infuser in place. 3.5" Diameter. 5" W with handle. 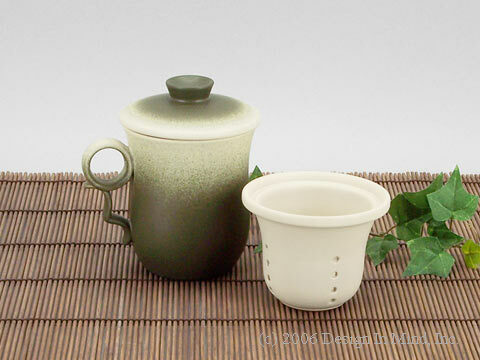 Stoneware infuser mug set - 9 oz. Creamy colored stoneware with green glaze. Set includes 9 oz. mug, infuser and lid. Lid doubles as a coaster to hold the infuser after brewing. Comes in a gift box.